Lakers head coach Damon Whitten (shown here during the annual Blue vs White game) was recently inked to a four year contract extension, per a press release from LSSU (Brittany Litchard/LHB). SAULT STE. MARIE — Lake Superior State University announced today that head hockey coach Damon Whitten has been signed to a four year contract extension. Whitten, who has been head coach of the Lakers since 2014, has compiled a 43-90-18 record in his first four years behind the bench. Before being named head coach of the Lakers, Whitten served as an assistant coach for four seasons at Michigan Tech, where he worked under Jamie Russell at first, and later Mel Pearson. Prior to that, Whitten had stints at Alaska Anchorage on Dave Shyiak’s staff, and at Wayne State under Bill Wilkinson. In addition, he worked as Director of Hockey Operations from 2008-10 at his alma mater, Michigan State. A native of Brighton, Michigan, Whitten played under one-time Lakers head coach Ron Mason at MSU from 1997-2001, where he scored 35 goals and 40 assists in four seasons, eventually serving as an assistant captain his senior season. “University presidents look for qualities of character more than records when assessing coaches,” said Lake Superior State President Dr. Peter T. Mitchell. “Damon Whitten is a person of great personal integrity and genuine compassion for his players. He emphasizes sportsmanship, hard work, and a commitment to excel on the ice and in the classroom. His team’s GPA is consistently above 3.0 and the current players are great ambassadors in the community. In his four years at the helm of the program, Whitten has made it priority to rebuild the Lake State Hockey tradition, while targeting increased community involvement, connection with the student body and excellence in the classroom. 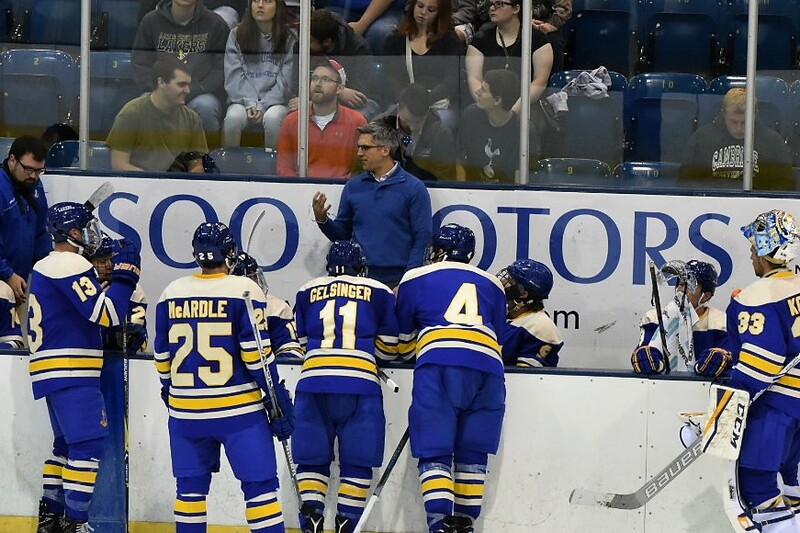 “On behalf of our staff and our families I would like to thank Dr. Peter Mitchell and Dr. David Paitson for their support and the opportunity to continue to lead the storied hockey program at LSSU,” said Whitten. In 2017, the LSSU hockey team was awarded Community Partner of the Year by the United Way of the Eastern Upper Peninsula for their involvement in outreach events throughout the Sault Ste. Marie community. Narrowly missing out on a postseason berth this season, Whitten has still managed to lead the Lakers to the Western Collegiate Hockey Association Tournament in his first three seasons while navigating the significant obstacle of losing top talent to professional hockey. With an assistant coaching staff consisting of Sault Ste. Marie native, Rich Metro and NHL veteran Mike York. The Laker hockey program has continued to focus on recruiting high-level talent with an emphasis on individuals seeking a complete student-athlete experience. “We are very excited to continue to have Damon at the helm of the Lake State hockey program,” said Director of Athletics Dr. David Paitson. “We believe Damon’s leadership and dedication will help reestablish the Laker Hockey program as one of the elite programs in college hockey. Senior defenseman Kyle Chatham (seen here in a game against Alaska) signed with the Reading Royals of the ECHL, becoming the 2nd senior to sign this year (Mike Barrett/LHB). READING, Pa. — Another Laker senior has signed a professional contract. Defenseman Kyle Chatham has signed a deal with the Reading Royals of the ECHL. 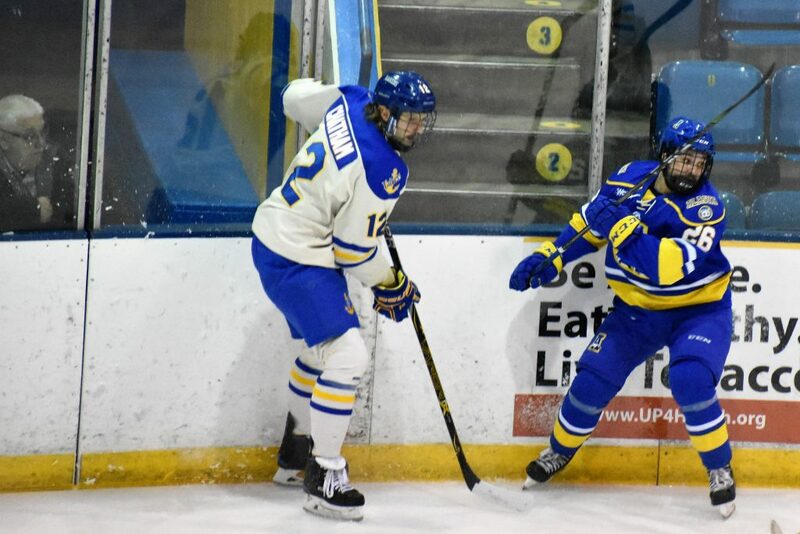 Chatham recently concluded a remarkable career with Lake Superior State, where he was a consistent force on the blue line. In his sophomore and junior seasons, he was voted Defensive Player of the Year by his teammates. In addition, he was also named Most Improved Player after his sophomore year. Over his four years donning the anchor, Chatham netted five goals and 19 assists for 24 points in 145 games. There were only six games in which he did not play over his career. A well-disciplined player, he never took more than 14 penalty minutes in a season. The native of Belleville, Illinois, is the second senior to sign a pro contract following the conclusion of the Lakers’ season. Forward J.T. Henke recently signed with the Greenville Swamp Rabbits, also of the ECHL. Chatham’s brother Connor also plays in the ECHL, where he is a forward for the Idaho Steelheads. The Royals are the ECHL affiliate of the Philadelphia Flyers and the AHL’s Lehigh Valley Phantoms.